Platform is a unique organisation combining art, activism, research, and education. Based in London, for over a decade it has been exploring the multi-dimensional reach of the oil industry into society, a ‘Carbon Web’ that encompasses governments, giant oil companies, banks, and a myriad other organisations, from law firms to universities, NGOs to cultural institutions. Written by two members of Platform, The Oil Road is an important component of this project, focussing on the story of how Azerbaijani crude oil ends up on the garage forecourts of Europe. 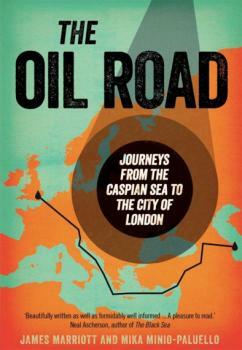 In one sense the book flows linearly, reproducing the oil’s journey from oilfields deep under the Caspian Sea, by pipeline to the land near Baku, up over mountains to Tbilisi, then into tankers at Ceyhan, across the Mediterranean to Trieste and then back into more pipelines for the journey to Austria, the Czech Republic and Germany. But all along the way the authors take us on countless additional journeys to explore how all this came about, and what it means; for example, uncovering how BP was, and still is, able effectively to dictate terms to states like Azerbaijan and Georgia, and the role it and other oil companies play in propping up authoritarian regimes and suppressing independent critical voices within those countries. Defying categorisation, it simultaneously blends travel writing, political analysis, history, investigative journalism, family stories, geography, oil engineering primer and more. It flows and pulses in parallel with the oil, and with each page the reader is conscious of that dense black river of liquid geology, distilled ancient sunlight, being sucked from the Caucasus across mountains and sea to feed Western Europe’s insatiable thirst for energy. We often hear talk about “joining the dots”, seeing the connections between issues, but the challenge of sustaining that comprehensive vision and analysis is beyond most of us. Thankfully there are books like this that are able to grasp and communicate this sort of profound intellectual synthesis. The result is a serious, unsettling read. Yet, somehow, deeply satisfying too.